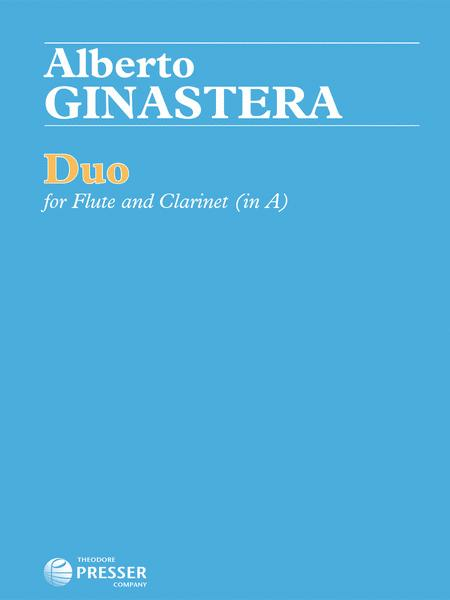 Composed by Alberto Ginastera (1916-1983). Arranged by Daniel Dorff. This edition: Arrangement of 'Duo For Flute And Oboe'. Arrangement of 'Duo For Flute And Oboe'. Contemporary. Performance score. With Standard notation. 16 pages. Duration 8 minutes, 30 seconds. Theodore Presser Company #154-40017. Published by Theodore Presser Company (PR.154400170). 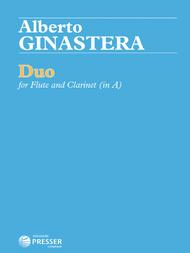 Ginastera's Duo (1945) is familiar and standard repertoire for most flute and oboe duos. In three movements (Sonata, Pastorale, Fuga), the composer immediately found a welcoming audience in the United States, including Virgil Thomson, who proclaimed, "This is the kind of music which makes one believe and have confidence in the New World." Now, Daniel Dorff retains the original flute part, while transposing the oboe to clarinet in A with an ear for idiomatic accuracy. For advanced performers. Duration: 8'30".